Full Rules Muay Thai │ 5 X 2 Minute Rounds │ 165 lbs. The fight started out with Miyagi feigning to create the impression that he was going to move forward. He was trying to break MacKenzie’s rhythm. Although this carried over into round two, it didn’t keep MacKenzie from putting some aggressiveness and power into his attacks. 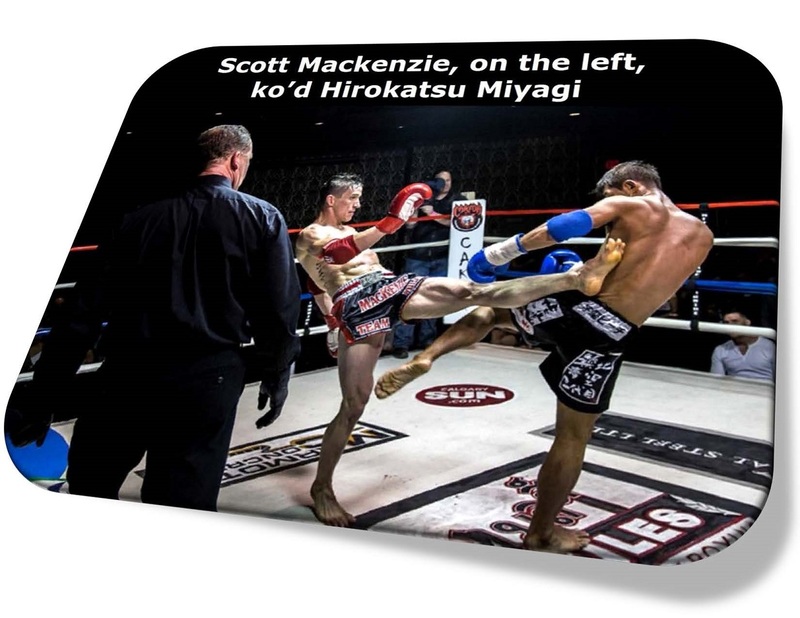 MacKenzie’s advantage in height and power was visible in the Japanese athlete’s loss of balance on the way to being knocked down. It got to a point in round five that the Canadian’s strength was overwhelming. Full Rules Muay Thai │ 3 X 2 Minute Rounds │ 145 lbs. Both of these athletes have spent a fair amount of time training and fighting in Thailand. Both also have lots of experience. This was an exciting bout with the smaller Mongolian pressing the action, while the taller American used his reach to avoid trading with Chukaa. The fight unfolded with Chukaa moving forward, throwing big punches and then both athletes going to the clinch. Chukaa’s big punches more often than not had Richard’s head snapping violently backwards. Richards got in some very solid scoring kicks. The American and Mongolian both did some skillful clinch work with Chukaa getting the better of it, dumping Richards several times. Even though the verdict was unanimous for the Mongolian fighter, it was very close and entertaining bout. Full Rules Muay Thai │ 3X 2 Minute Rounds │ 170 lbs. This started off as a great fight. Lucus was pressing and throwing, while Avtandilashvili hit and moved. Greer’s straight left had Shalva stumbling back. When Avtandilashvili fell into the first clinch, Lucus literally picked him up and ran him to the ropes. Shalva landed a good right that made Greer fall back. Both continually probed at each other. On the second clinch, Avtandilashvila was cautioned. It was hard to tell but most likely for holding the ropes to get the clinch broken up. It was visible at this point that something had happened, as both athletes had a little blood on their heads. This most likely occurred during the clinch, but there appeared to be no concern from the referee. He let the fight continue. Greer flung himself forward into a superman left hook with his right hand very low. In throwing his head forward, it was completely unguarded. Shalva tried to counter with a straight left at the same time. Both heads connected. They immediately fell into a clinch, and Avtandilashvili followed with a very hard left uppercut. Then he delivered a right uppercut followed by a cross, forcing Lucus back to the ropes. Shalva followed with a left knee directly to Greer’s liver. Slouching forward and falling, Lucus sat on the second rope. He was sitting there, when Avtandilashvili blasted two lightning fast non-clinching left knees directly to his left forehead. Greer went down. When he turned over, an ugly cut was visible across his left eye. The officials called the fight a No Contest due to an accidental ‘foul’, which stirred some controversy as to whether the head contact or Shalva’s knee strikes caused the bleeding. In New Jersey, they could’ve gone to an instant re-play. It was a great fight up to the stoppage. Modified Muay Thai Rules │ 3 X 2 Minute Rounds │ 152 lbs. Eddy Chang took this fight on short notice. Originally slated to be a Full Rules Muay Thai bout, Andrew Rivera’s original Canadian opponent pulled out. After searching for a good candidate to accept the bout, the promoter found Edmonton’s Eddy Chang. Because the fight was a full weight division above what Chang fights at, the Edmonton camp asked for no elbows and the American camp accepted. Eddy looked good on the outside with fast punches and kicks. Rivera looked tentative at Chang’s offense. Eddy unloaded and had Andrew in trouble with seconds to go in the first round, but he was saved by the bell. The second round was more even. While the American was successful when he had Chang moving backwards, Rivera could not maintain the pressure. The final round was pretty much Eddy’s. Despite not getting hurt, Andrew played too much of a defensive game in round three. Doing so gave Chang license to do what he wanted. When the votes were tallied, it was Andrew Rivera whose notice came up short on the score cards. Modified Muay Thai Rules │ 3 X 2 Minute Rounds │ 150 lbs. From the get go it was obvious these two talented athletes were looking for a knockout. Both athletes have good experience under their belts and possess KO power in their hands. This fight was not going to let anyone down. Both moved very well and, when the fight was completed, the nod went to John Nguyen. Modified Muay Thai Rules │ 3 X 2 Minute Rounds │ 130 lbs. Both athletes own title straps to wear on their waists. Macmillan took the fight on short notice. This was compensated by the fact that she’s had multiple times Cameron’s fight experience. The experience showed from the opening bell, as Macmillan veritably sprinted at her opponent to apply immediate pressure. The Calgarian was successful in round one with counter punches, kicks, and knees within the clinch to ebb the tide that was to become Macmillan. As the fight progressed, though, the pressure took its toll on Meaghan. She became flatfooted and struck mostly off a retreating step. Robin knew from her constant pressure that Cameron could not sit on any of her strikes. Pressing constantly, Macmillan did take a lot of blows in round two, but she pushed herself forward through the punishment. By round three, both fighters were completely fatigued. Neither had enough energy to put the other one away. It was an awesome scrap. Modified Muay Thai Rules │ 3 X 2 Minute Rounds │ 140 lbs. 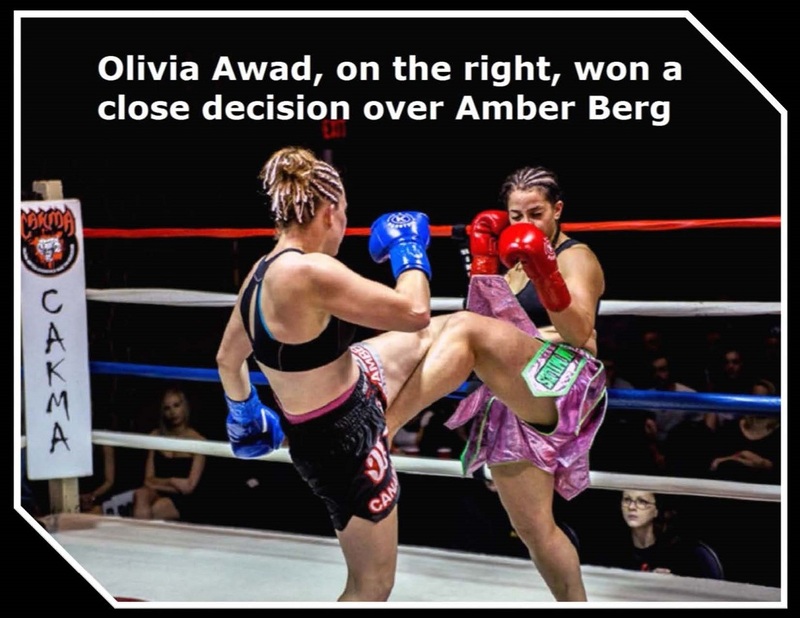 Olivia Awad and Amber Berg both brought enough power, technique, drive, and commitment to race through the fight. This bout didn’t let anyone down, who was expecting action. It went straight out, from the first bell to the final bell. The road map of this fight set a torrid pace for three laps around the track. Amber came out fast, applying as much pressure as she could. Olivia intercepted her with punches, kicks and/or knees. In the clinch, Awad took her time. She successfully dumped Berg on the canvas a few times. Amber proved to be the proverbial energizer bunny. Even when getting hit, she continued pressing forward. By the final round, Olvia was looking weary. To her credit, though, she still kept up her work rate. So did Berg. Close though it was, Awad came away with a three win fight streak. Modified Muay Thai Rules │ 3 X 2 Minute Rounds │ 145 lbs. This was the first of two encounters featuring Calgary vs. Red Deer. Both athletes were in the ring for their first time. They were very aggressive from the opening bell. Sean seemed better able to evade and, as the fight wore on, he definitely had more in the gas tank. In round two, fatigue overtook Owen. His legs straightened and lost their spring. Holmes continued to pressure Gavin. He landed bunches of punches with the telltale smacking noise on Owen’s headgear. The final round saw Gavin in survival mode. A succession of punches to the head put him on the canvas. To his credit, he toughed it out and finished the fight on his feet. Modified Muay Thai Rules │ 3 X 2 Minute Rounds │ 175 lbs. Calgary’s Nick Gallipoli had a hard time finding his range – standing 5 feet 9 inches to the towering Justin Rocheleau at 6 foot 3 inches. The battle see-sawed back and forth during the fight, with Justin being able to deliver cleaner kicks, knees, and punches. The shorter Gallipoli threw lots of wide leather, with most missing throughout the duration of the bout. In rounds one and later three, Nick’s wide leather successfully connected a few times, stiffening up Rocheleau on his legs. But Gallipoli could not capitalize. In round two, Justin’s successive short punches forced Nick backwards with. Whenever the audience figured Gallipoli was done or in need of a break, the Calgarian would swing back, temporarily turning the tide. A few exchanges throughout the fight – specifically throwing attempts – brought some noise from the audience. Rocheleau attempted to pitch Nick at one point, only to find himself landing face first on the canvas. Both athletes were in the ring for the very first time. They were both completely spent by final bell. Scott MacKenzie added more hardware to his resume by winning the Roy Lilley trophy, as chosen by the Ring Sports Officials Association. Eddy Chang from Edmonton was awarded best visiting fighter for his performance against the USA’s Andrew Rivera. ‘Dissension’ International Muay Thai Gala featured athletes from Mongolia, The Republic of Georgia, Japan, the USA and Canada. The athletes from the first three countries could not speak English, but it didn’t make a difference in terms of the fighting or the results. Great fights all around. 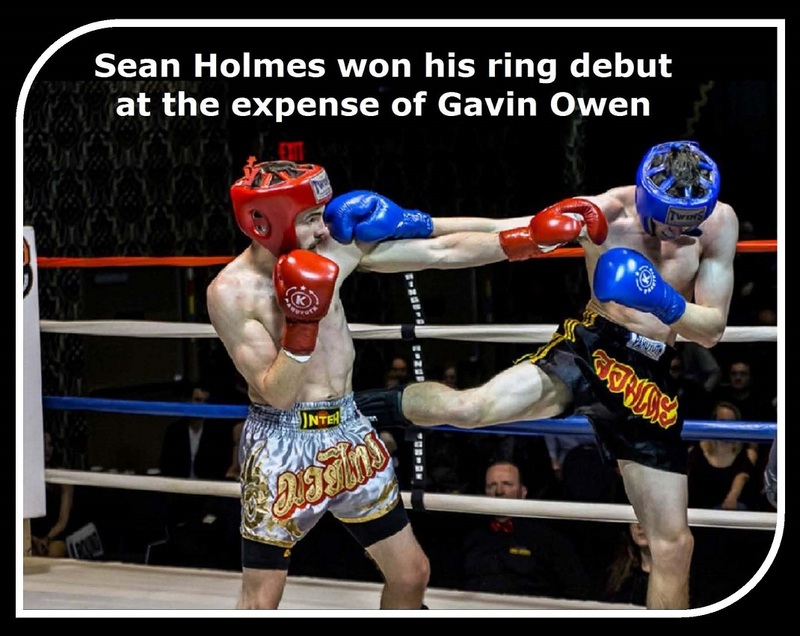 This entry was posted in News & Results and tagged Ajarn Mike Miles, Calgary, Canada, featured, Hirokatsu Miyagi, Lucus Greer, Muay Thai, Scott MacKenzie, Shalva Avtandilashvili, Shijiree Chukaa Shinjiro, Tony Richards. Bookmark the permalink.